If you think you don’t see a cow every day, you’re probably walking around with your eyes closed the whole day. I didn’t see today’s cow with my own eyes originally but the photo ended up in my mail inbox. I opened the photo attachment because I didn’t know any better. My husband got it from a friend and forwarded on to me with no description in the email’s subject line. There’s nothing better than discovering by email that cows can fly! Holy cow! 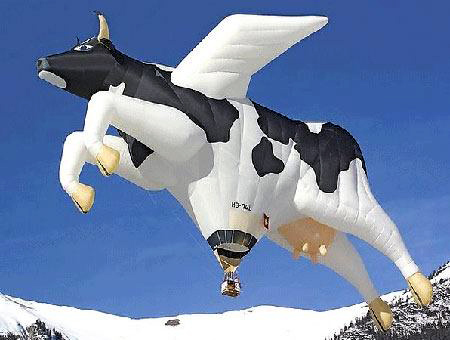 This isn’t the first time I’ve seen a cow hot air balloon but I think this one tops it because it’s got wings, feeling like an eagle soaring through the sky. What do you think? Previous Post It’s an invasion of cow slippers at Sears! I think I’m glad I found your blog. Haha, you think? Come on, where else would you see so many flying cows? I’m catching up on many cow sightings, so wait till you see what’s coming. It never ends. That is a very cool cow :) I wonder if it’s chasing a flying pig? How’s that hubby of yours? He’s done with rehab and back at work 4 days a week, taking it easy while he gets his stamina back. I’ve got so news to share on my other blog but I haven’t figured out a way to say things yet, so I’m thinking it over.